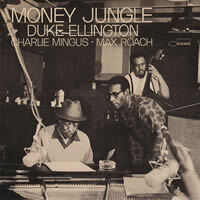 Duke ELLINGTON: Money Jungle. Ellington (p), Charlie Mingus (bs), Max Roach (dr). Blue Note 7243 5 38227 2 9 (http://www.bluenote.com/). In the wake of Art Lange’s knowing words on Ellington, I’d like to commend a curious trio session, taped on 9-17-62 with bop titans Charlie Mingus and Max Roach. Enormous differences aside, the Duke’s example was crucial for Mingus. (“It’s absurd to put Ellington in polls. He should just be assumed to be in the first place every year.”) But the bassist hadn’t played in a trio in five years, and Ellington wasn’t accustomed to such adventurous sidemen. By the finish, there’s musical blood on the floor (reportedly they got along well). Mingus pushes right through the changes on the classic “Warm Valley,” and his supremely active solos and countermelodies take over “Switch Blade.” Ellington delivers assertively on the punchy title track, while the famous opening of “Caravan” is conveyed in broad, dark chords. The vinyl release (United Artists UAS 15017) had seven tracks. A previous CD edition added some material but changed the order. The count now stands at four numbers not on the LP and four alternate takes, with the LP’s original contents restored at the top. A list of all tracks in the sequence they were recorded figures in the booklet, as do the original LP’s notes (rather overheated) from impresario George Wein. Nine days after this stint, Ellington would be in the company of Coltrane and their teams of sidemen, working on another album. For its beauties and its oil-and-water oppositions, the finely remastered Money Jungle continues to intrigue.